The repositioning strategy of recent years reached critical mass as laser printing and mail personalisation emerged as the biggest single profit-earner. Bidvest Paperplus is increasingly seen as a network of specialists capable of transitioning across formats. Skills developed in an ink-on-paper environment are applied to various substrates. Diverse printing, imaging and communication formats are accessible at one customer touchpoint – a vital factor for customers looking for a single supplier capable of meeting multiple requirements. Bidvest Paperplus is now industry leader in full-colour digital printing, another indication that the strategy of rebalancing the business has proved successful. It was a watershed year. Recession forced businesses to seek economies and re-examine past practice. One effect was the further erosion of conventional printing and conversion volumes. Customers with a traditional attachment to ink-on-paper solutions moved to e-mail statements or other digital formats. Others cut back on quantities or redesigned their forms. A three-page solution became a two-page solution and so on. As the economy moved out of recession, customers preferred to stick with new solutions – confirmation that policy decisions had been taken on expense items and cost control rigour would be maintained. 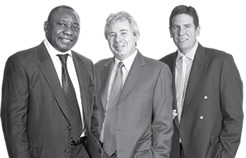 Bidvest Paperplus performed well in a challenging market. All teams put in a creditable performance, including those who faced a severe decline in sales as a result of new buying patterns. Inventories were cut and debtors strictly controlled, resulting in improved cash flow and a better average return on funds employed. Revenue rose 8,2% to R2,1 billion (2009: R1,9 billion) while trading profit moved 10,8% higher to R248,3 million (2009: R224,2 million). World Cup-related business offset the absence of big export contracts. Changes in demand patterns resulted in the rationalisation of capacity in some areas, but staff numbers remained stable. Strict cost control resulted in a war on waste while the growing appeal of digital formats reduced paper usage. Improved measurement confirms that good sustainability practice is good business. Business sustainability considerations underpin the entire business. Over-capacity in some parts of the printing industry led to intense competition, squeezing some margins. Marketing budgets were slashed and business cut the printing and stationery spend. It appears that all spending on office consumables by customers is scrutinised before sign-off. Government is adopting decentralised tendering for some print work and scholastic supplies. Local rather than national contracts reduce print runs. Bidvest Paperplus is not dependent on government contracts, but several large printers are geared up for this type of job and may now find it necessary to seek replacement business. The potential for cut-priced competition – especially in stationery – was apparent by year-end. In challenging conditions, we derived relative advantage as volumes traditionally channelled to one specialisation were redirected to others. The export cycle, favourable last year, proved less so this year. We specialise in print and fulfilment work for election and voter registration contracts. With few major elections in sub-Saharan Africa, demand fell. Revenue was assisted in May and June by work on VIP ticket packaging and personalisation, our biggest single FIFA World Cup 2010™ contract. The rand remained stable as did most input costs, though pulp prices went up. Electricity costs rose significantly and pressure rose on the wage bill. Whenever possible, higher pay awards were made to the lowest paid workers. Long-run print demand plummeted and the Cape Town business forms plant was scaled down. Two Johannesburg label operations were consolidated into one. The acquisition of Pretoria Wholesale Stationers was completed at the end of last year on the run-in to the peak back-to-school period. This delayed the integration of the stationery operations of PWS and Silveray Statmark. Consolidation began in the fourth quarter. Areas of duplication are being removed in Johannesburg and Durban. Considerable efficiencies are expected. To achieve sustained efficiency and quality improvements, performance champions were appointed. They apply a six-sigma methodology that imposes constant measurement and rigorous self-assessment. The initial champions have been deployed at the Lufil Packaging operation in Isethebe, KwaZulu-Natal, the Silveray manufacturing site in northern KwaZulu-Natal and Lithotech Manufacturing Pinetown. Effects will not be evident until next year. A preventive approach was taken to debtors management. Creditworthiness of customers was reassessed before cases of one year late payment occurred. Strict credit controls were applied. Annual financial and other performance targets, such as waste reduction, are set for each operation. There are no overall divisional targets as some segments of our industry are in decline while others show robust growth from a relatively low base. Margin management is complicated by varying levels of on-selling in each operation. When a business controlled all production, service, storage and delivery functions for all products, margins could be compared with the previous period as the same level of control had been maintained for years. Now some outputs are internally controlled while others are bought in to be on-sold as part of a total package. On-selling elements vary from company to company. The net effect is more margin pressure. Workplace safety is a key area for measurement and improvement. Empowerment and transformation are measured continually. Independent assessment is carried out by Empowerdex. Our manufacturing businesses are heavy users of electricity and water, while distribution operations are big users of petrol and diesel. These are increasingly expensive inputs. Measurement and reduction are critical. Lithotech’s brand strength was leveraged during an attack on related markets as our fulfilment service operates under the Lithotech banner. The Lithotech name was promoted internationally as part of our drive to secure more export work. We acquired the South African distribution rights to the strong international brands, Parker, Papermate and Waterman. They are being marketed as part of a wider Silveray Statmark offering. We bought the Croxley brand rights in southern Africa and have begun to expand the range by launching non-paper-based Croxley-branded general stationery items. We launched an aggressive attack on allied markets and differentiated ourselves strongly as one-stop solution providers. Procurement proved to be a big growth area. Fulfilment services, covering print and non-print items, became a strategic contributor to the business and for the first time we used BEE accreditation as a sales tool. We opened a Lithotech export office in Denmark in collaboration with a Danish associate company. The premises are near the Nordic Office of the UN Development Programme. The main focus area is printing, fulfilment and project coordination in support of elections and voter registration programmes. Lithotech is one of the main sponsors of an upcoming international conference on election challenges, vote counting and new election-related technology. We have entered the market for on-demand digital printing solutions, focusing on course notes, training manuals, technical and specialist publications and short-run book production. No new acquisitions took place. Investment in new property, plant and equipment totalled R44 million. Facilities at the recently launched Bidvest Paperplus training academy were made available to students on the block release courses offered by the Printing Industry Federation. The collapse of the media, advertising, publishing, printing and packaging sector education and training authority appears irrevocable. A lead had to be given or risk continuing limbo in industry training. Select your areas of interest from the list below and submit your selection to create the PDF ready for you to download.